Album Review's Latest 200 Album review's. Opeth started out as a “Death-Metal” band with some progressive influences, but over the years they have gradually become more and more progressive. On “Heritage” they have gone all the way and made an all-out progressive album without growling, blast-beats and Death-Metal riffs. This is a bold move by any standards, but according to band-leader Mikael Åkerfeldt the only way for him and the rest of the band to feel satisfied. So what about the album itself ? It starts out with the title track “Heritage”, a beautiful piano piece, inspired by Swedish folk/jazz pianist Jan Johanson. This leads into a piece of “heavy” prog called “The Devil's Orchard”. The organ tones midway makes me think of what Jon Lord sounded like on “In Rock”. It also contains a brief but extremely beautiful and soaring guitar-solo by Fredrik Åkesson. ”I Feel The Dark” is a varied number, starting out slow and moody before it turns heavy. In many ways this is a typical Opeth number, but this time it's seasoned with chunks of mellotron and flute reminding me of early King Crimson. Next up is “Slither” which pays tribute to 70's hard rock and Richie Blackmore's Rainbow in particular. Even if Mikael Akerfelt is a big fan of said band, this song is perhaps the most untypical Opeth number of all time, but in a strange way it fits in and a welcome “upper” before total “progdom” takes over on the rest of the album. Tracks like “Famine” and “Haxprocess” is complex stuff and takes time to get into but after a while things fall into place. Overall the musicianship is spot on without meaningless show-offs. A special mention has to go to drummer Martin Axenrot and gutarist Mikael Åkesson in particular. He's a “shredder” by birth but on this album he sounds like a cross between Ritchie Blackmore and Alan Holdsworth. 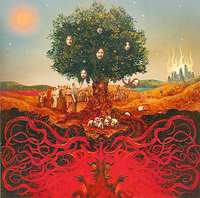 In my mind “Heritage” is Opeth's best album to date and a very promising start to their “new” career as all-out proggers. Miss it at your peril !